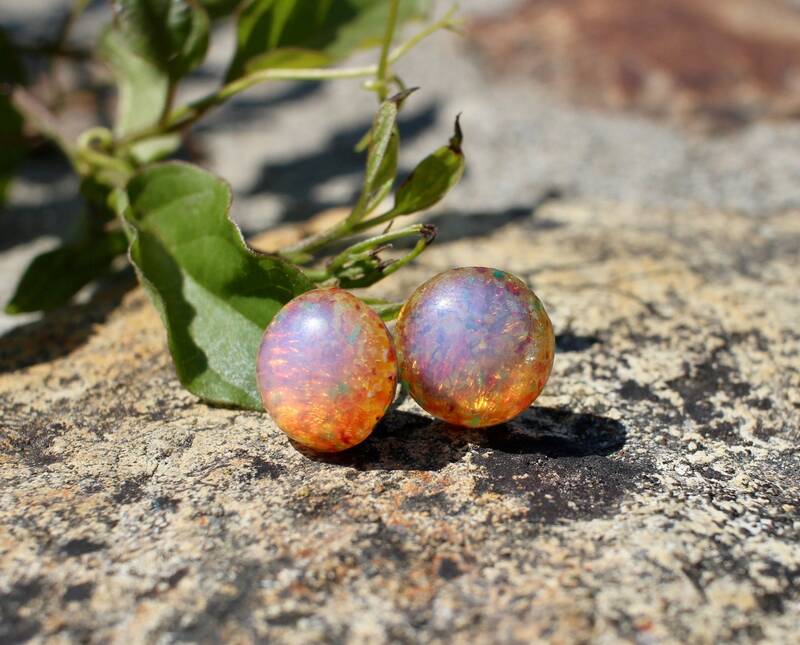 These fire opal are vibrant and eye catching! They play with the sun all day long! The round, 12mm triplet opal earrings makes a beautiful statement! They are mounted on pure titanium posts, the pad is surgical stainless steel and the ear nut is plastic, so everything is hypo allergenic! We are passionate about hypo allergenic because our owner has ears just as sensitive as you! There is nothing worse than to find a CUTE pair of earrings that make your ears itch and burn! We hope these give you NO issues! This pair is medium weight and not too bad on the ears. They are incredibly durable, double checked for strength and made with extra love! They are sure to get your lobes noticed! Try them on today and let us know what you think! Leave a review, share a pic and tag us on social media! Earrings are super cute and my sensitive ears are taking well to them! Fast shipping and they look beautiful.